Tomorrow is November 1.... let's see, what happens in November? Can't seem to remember. I need some coffee, and so do you. I made some Sumatra this morning for us, french press as always. Todays mug came to me courtesy of our local TU chapter prez Brian Kozminski. It's an awesome Derek DeYoung print mug and I love it. Many thanks to Brian for that. Brian and his family will be leaving us soon, moving out to Greeley Colorado (what is it with that state?). I interviewed Koz about 6 months ago (You can read the interview here) and I'm hoping to do another short sit-down with him before he leaves and discuss his accomplishments and what his hopes for Colorado are. Here, let me warm that up for you. Oh, I know what happens in November- deer hunting. I'm an avid bow hunter, but between moving this month and being busy with work, I haven't gotten out. The rut is really starting to crank up now, so I'm hoping to get a week of hunting in before the guns come out November 15 and ruin it all. It usually takes me about a week to fill a tag with a bow, and looking in the freezer, it's time to get out there and stick an arrow in something. I've gotten two decent bucks the last two years, so here's hoping I'll continue that trend. I have another goal I'll spout publicly- in thinking about my fishing, I don't think I've ever caught a fall steelhead on a fly. I've gotten some on spinners back when, but not fly fishing that I can recall. I think I need to change that. Those fall fish are bright as dimes and at their fighting best, so I'm making it my goal to catch a steelhead in November. I'll try to whack a deer here in the next couple of weeks, and then while all the gun hunters are whanging away at the deer, I'll hit the rivers in search of steel, and just try not to get shot in the process. What can you expect this week at Fontinalis Rising? I'll do my final installment about my recent trip to Colorado, Brandon Robinson will update us Thursday on how his 30 Days of Fishing is going, and I'll make the effort to write the November installment of my Angler's Year series. Credit where credit is due- I first saw this yesterday on The Fiberglass Manifesto. My thanks to Mr. Mortenson for always having his ear to the ground. The reason I'm sharing it is because I watched this trailer at least a dozen times last night, and several more times today. I love fishing for pike and musky- they are big predators, and fishing them always involves drama. I was at the premiere of "Connect" in Denver last week, and the pike fishing sequence was one of my favorites. I hope this video is as exciting as the trailer. This whole idea almost went to crap on day one. I bought a computer a while back and thankfully bought a warranty. About two months ago, the computer quit charging and I had to take it in for repair. They gave me a loaner as part of the warranty. Flashing back to last week, they called on Thursday to say it was ready to pick up. Crap. I executed a command decision, and 86’d the exchange. They can wait, the “Acid Pond” called to me like that nasty looking Chinese place you know you’re going to get food poisoning from someday, but still eat at. It isn’t the most glorious place; in fact, “downright hideous” is more apropos. Fishing it is mostly like riding a moped, all fun and games until someone sees you doing it. There is no room for pride here, this is guerilla fishing. I am playing to win, it is very close to work, and I knew fishing there wouldn’t kick this whole shindig off with a skunk. I get out there and it was dead for two solid hours. I started sweating the failure, feeling like I had just asked a pregnant chick when she was due, only to find out she wasn’t expecting. No fish at all on my first day out? I was going to lose all my stream-cred! It was a panic attack until 1600hrs on the nose, and then I hooked up four times in a row. Thank freakin' geebus. Day one total? 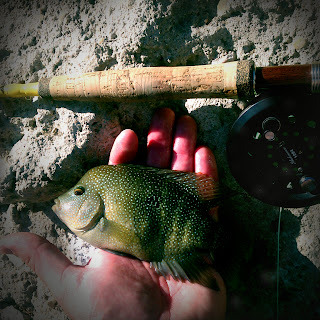 Two eight inch bass, two little sunnies (One bluegill, one tiny redear) and three tree limbs. Somewhat begrudgingly, I resigned to the fact that the tree limbs don’t count, despite the masterfully executed hook-set into each one of them. The next day, shaped up to be worse than the first, the procrastination caught up to me with one (kind of snotty) phone call about my computer. It seemed a night fish was inevitable, and I was not looking forward to two hours of, “one more cast, and I’m going home.” The next day was Saturday, I wanted rest before. Luck prevailed, leaving me with seventy-five minutes to fish and a pond on my way back. This particular pond claimed my F2; kick-starting the head-spinning and wallet-slaughtering, ‘Summer of Broken Rods’. Yet, here I was again, on the other end of summer… With another glass rod. Fishing it was an exercise in patience, but the catching was decent, adding a fourth species to the list (Green Sunfish). Even though I avoided the night fish, I face-planted into a lack of sleep, finally passing out late enough that MTV was actually playing music videos. Monday wasn’t a skunk, but I didn’t add anything new. Tuesday however, I drove up to Brushy Creek and pulled in a seventh (and most surprising) species. With the cooler temps poking around like a nosey neighbor, I had assumed all the Rio Grande Cichlids had holed up for the winter, as they usually are the first to do so. Imagine my excitement when I nailed one on a Moorish’s Small Fry (also rare, in my experience)! Yesterday was amazing, after watching live video-feed of a dam removal in Washington State; I almost missed my window, leaving me only the “Acid Pond” to fish. It turned out to be the highest number day so far, with me losing count at around 15 small bass to hand. That’s a week of fishing, in a slightly hurried nutshell. Initially, I thought the fishing might wear me down. Instead I am afraid it is going to be time management that will do me in, if anything. I have to be careful with that. Stumbleupon is lurking in the shadows, ready to snare me every time I crack the laptop, but I know it’s there, and knowledge is half the battle, right? Speaking in terms of non-fishing factors, I really wasn’t prepared for the added stress of blogging about the thirty days either... It isn’t easy when it takes you seven days or more to write about one trip, to suddenly write about seven trips in one week. If Vegas is keeping odds, I have another variable added recently, there might be a trip to Tulsa in the mix this coming week, although I’m fairly certain I can cram the required hours in. All in all I feel good, yet reserved. Seven days is a start, but I have done that without noticing before. I shouldn’t start chest-thumping quite yet. Don’t forget to vote, FR has streamlined the procedure so there is no excuse! I’ll be back in a week, until then… See you downstream! And make sure you check out Brandon's site to read other great posts, relive Twitter history, and browse the OBIF swag. Okay- I hear what you're saying. Not Fair!!! 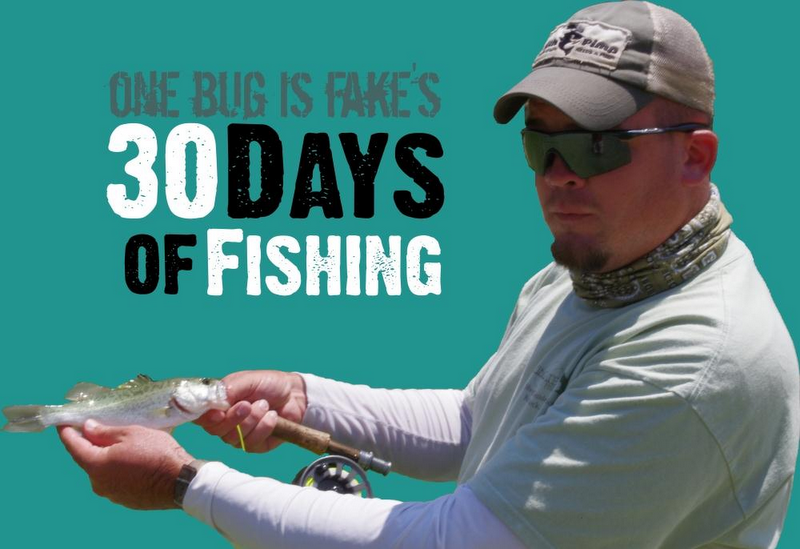 Last week Brandon Robinson announced a quest to fish for 30 days straight and give you a chance to win a T-shirt. To be honest, we haven't gotten a lot of entries. We both have day jobs and aren't professional contest designers, and a few holes in our plan became clear. For one thing, the way we had it set up there was no guaranteed winner, which is no fun. Plus, the entry process was too complicated. What I've done is simplified the rules and the entry process. To enter, just go to the sidebar and fill out the form. Go ahead, it's right there. You can see it now. The next change, is that at the end we will draw from one of two pools. If you think Brandon will complete his quest, vote yes in the form and be done with it. Thanks for rooting for him. If you think he's too lazy, know about an impending plague, or just don't think he's up to the challenge and you want to bet against him, vote no, then enter the date you think he'll fail by. By the way- All existing entries are still valid. Here's where it gets interesting. I've decided to add a bonus prize to the T-shirt that Brandon is giving away. It's a Large Morell fly box. Who doesn't need that? 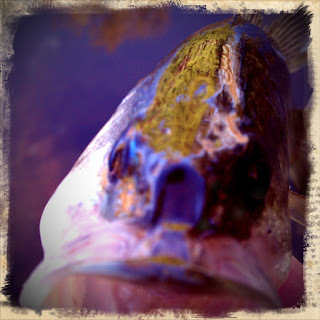 (if you don't fish give it to the angler you love- you do love an angler don't you?). If you voted for Brandon (yes) and he succeeds, whoever gets drawn will get the shirt plus the bonus. If for whatever reason you've voted against Brandon and he fails, the person who guessed his fail date correctly will win the T-shirt and the bonus. If multiple people guess his fail date correctly, I'll do a drawing. If no one gets the date right, I'll draw from everyone who bet against him and someone will get the shirt. Brandon succeeds and you voted "yes" you're entered to be drawn for the OBIF T and Morrell fly box. Brandon fails and no one guessed correctly and we'll still draw someone to win the T.
Got it? Go, fill out the form, and don't forget, Brandon will be posting his progress here each Thursday until November 18th; look for his next post tomorrow! The wind is blowing a howling gale that has raged for four days now. In town the bay is open to the full onslaught of the west wind. 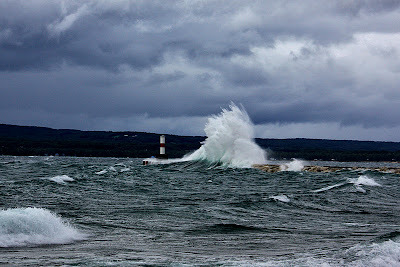 Waves formed across 100 miles of open water grow in size and volume, until they pile up 6, then 10, even 20 feet or more, then explode against the breakwall that protects the harbor, throwing spray up to 60 feet in the air. To stand there at the foot of the wall, lean into this wind and feel the ground shake from the pounding of these waves inspires awe, and fear. 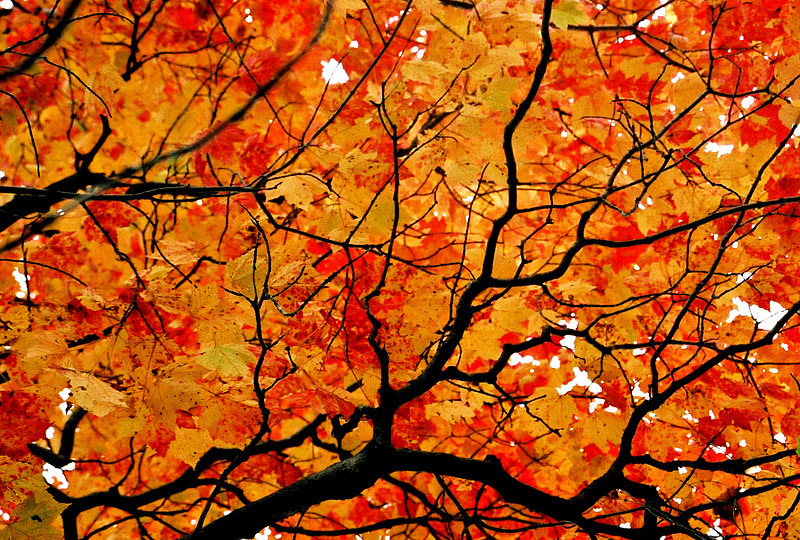 October marks one of the year's greatest transitions. It starts with plenty of decent weather, and the leaves are still on, though starting to change color fast. By the time it's over, the trees will be stark and bare, and most years here in Trout Country we'll have seen our first bit of snow before it's over. Nothing permanent, but definitely a shot across our bow. The deer get more and more restless, the beechnuts drop, the last of the apples ripen and fall, the grass slowly fades to that whiter shade of tan. It is a time of great transition for the angler as well- the general trout season here in Michigan is over. The salmon are still in the rivers, and some will still be chrome bright, but most will have blackened, grown moldy, then died. By late October only the bright gravel ovals will be there to remind you of the schools of huge fish that drew anglers to the rivers in droves. By late October, the fall streamer bite for steelhead and browns starts in earnest, a welcome change in my opinion, both from the brutish kings, and from the gentle dry fly season. I like being able to cast with authority- you want that fly to slap the water. Sure, you're going for accuracy, but delicacy in casting is not a prerogative. And nothing- nothing- matches the sight of a two foot long brown or even longer steelhead making a swing for your fly. You don't have to catch fish streamer fishing (though it is nice)- just seeing one of those fish chase your fly will make your heart pound for the rest of the day. It's the only part of this sport where not catching a fish can still make your season. 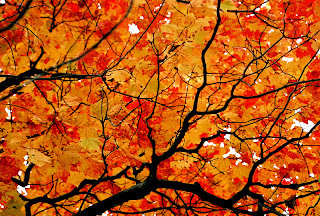 October is fall color season. The colors that started in September very quickly build, until every hillside is ablaze in yellow and orange, bright scarlet, even purple. They start at the high and low elevations and meet in the middle, like a match lit at both ends. The first leaves to drop are here on the river and around the lakes. 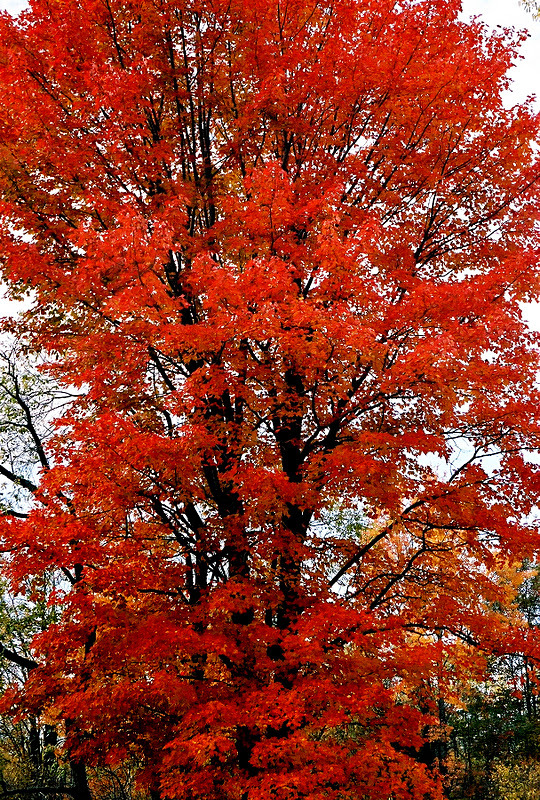 In a single week, the maples turn scarlet, then drop their leaves suddenly. I've never understood this. At higher elevations (and here in Michigan 400 feet can make a big difference) the leaves change just as fast, but seem to hang on longer. As soon as it peaks, in just a matter of days, the wind inevitably comes and strips the trees. This leaf fall can be very problematic for the fly angler, as mats of fallen leaves drifting downstream can make fishing almost impossible, sometimes for more than a week. I constantly hook-set into perceived weight, only to find that I've snagged more leaves. It also loads the river with floating objects, and I believe it makes the fish more reluctant to bite- they seem to tire of inspecting every colorful object. Once this onslaught of color and debris clears, the fishing improves markedly. What is October to the fly angler? It is bright colors on trees and fish, the smell of fresh fallen leaves, cooler water temperatures that get the fish feeding again. It becomes stark bare trees and a return to monochrome, that first hard frost and snow, and the first bad gales that mark the change to winter weather. It's the transition from dries and 5 weights, to streamers, eggs, chuck and duck, and heavier rods. It is the transition from a gentler time and camaraderie, to one of fortitude and self-reliance. It is a time of solitude on the river. If you hit it wrong you'll find moldy fish, or high, leaf-filled water in a howling gale. If you hit it right it marks some of the best fishing of the year. Author's note: since I started this post we've had three severe gale's in a week. According to data recorded by NOAA buoys wave heights topped out near 20 feet. And yes, the trees are bare. That's right. Thirty straight days of Lou Gehrig-Dale Webster-Strom Thurmond fishing. Thirty calendar days where I drop a line in the water, with the intention of catching fish. The brains behind the scene here at Fontinalis Rising has agreed to host this ulyssean undertaking, allowing room for a weekly update, succeed or fail, every Thursday for a month. Oh yeah, and to step it up a notch; I am doing it with glass only, specifically my Eagle Claw Featherlight 4/5 weight rod. This may not sound like a big deal, but here are the stumbling blocks I will have to weave around. It's football season. I work full-time, with an odd schedule: 1000hrs-1400hrs and 1800hrs-2200hrs, Monday – Friday. I live in Austin, Tx and this city is still stuck in a record breaking drought. 30 days straight is a lot of fishing... (In fact 42% of the fishing that Jason (FR) has logged for the year.) Lastly, I am kind of lazy by nature. Let's be honest, everyone that knows me is nodding their head a little at that particular confession. Here is what is working for me. I know of at least two ponds I can hit between shifts, which should help in a pinch. 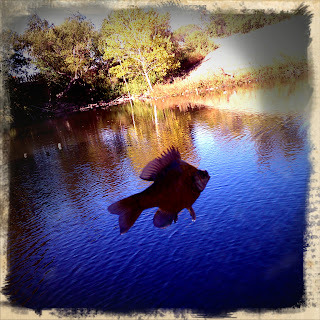 I do have weekends off, allowing serious travel time to find the water, and to catch picture-worthy fish. I also have no life, zero. No life, no kids, no girl; no other responsibilities outside of work. To quote the philosopher JZ Carter, “I got 99 problems...” Austin is creeping towards some semblance of fall, which is good for warm-water fishing. That also gives me a decent chance for a trout or two as well. Lastly, my teams are University of Florida and the Miami Dolphins so, not missing much there. 1. I must fish for at least an hour for it to count as an attempt. 2. I can only fish one day per outing. In other words, I can't start at 2330hrs and fish until 0030hrs and have that one trip count as two days. 3. There are no mulligans or do-overs. No excuses, period. Not for weather, illness, or work. If I miss a day, that's it, the party is over and I lose all credibility. 4. No fishing the same water more than twice in a row. 5. I will keep track of the various species that I catch. 6. The fishing count starts the day of this post, nothing earlier. Why should you care? Why should you read? Well, for starters, how much fishing are you going to get done in the next month? Not enough? Okay, I am going to sweeten the pot. Send an email to the FR's Head Honcho including your pick of the succeed/fail date with your mailing address, then comment on this story when you send the email. (Why the two steps? I don't want to know when the bets are, I just want to know who is playing.) There will only be one winner, but two levels of prizes. I am hoping that FR's resident random numbers girl can help with this... All correct day bets will be eligible to win. If your name was chosen, and you got the right number of species, your prize will be upgraded. Sound good? Cool, starting now, you have one week to get your bets in! Correct Date: 1 OBIF “Warning Label” shirt, green, any size. Gratis. Correct Date & Species: 1 shirt off the OBIF: any color, any size. Gratis. Recap: 30 days of fishing, with glass, and a prize ( See the shirts here.) at the end. I'm ready, are you? Okay, Brandon has thrown down the gauntlet, and now it's your turn. 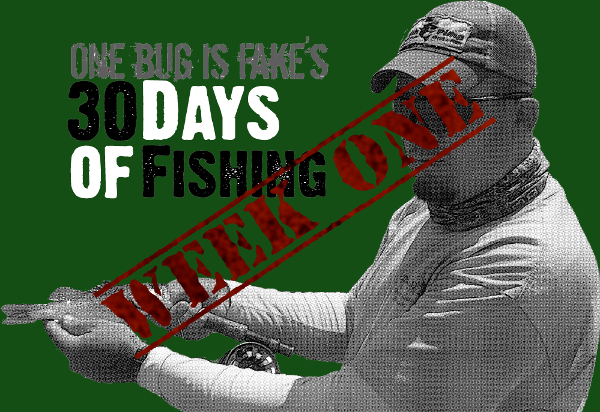 Send your entries to fontinalisrising@gmail.com with the subject "30 Days of Fishing" and your guess as to the fail date, then come back and leave your comment. Choose any date between today and November 18. We'll draw a winner the Sunday after his fail date, or Sunday November 20, whichever comes first. Make sure you check back next Thursday and see how he's doing. Be sure and check out his website at onebugisfake.com. His Best of @OneBugIsFake page is hilarious. Also, if you haven't already, please give me some love and vote for me (Jason Tucker) in the T.F.M. spotting contest at thefiberglassmanifesto.com. I had to get another plug in. 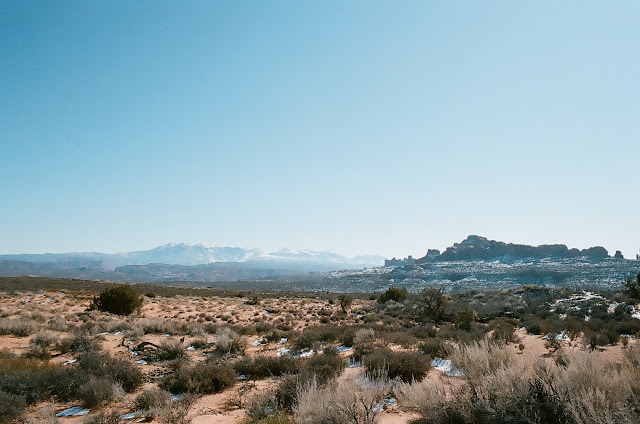 This last winter I was sitting at home between jobs (I'm self-employed, also known as permanently unemployed), when I saw a post on Facebook by Rebecca Garlock about the 100th post on the Outdoor Blogger Network. This begs the question- How did I get to be Facebook friends with Rebecca in the first place? I don't know, and since the rules on that change all the time at Facebook, I'll just say it's lost in the mists of time (or is it sands?). I've always had this itch to be a writer, but work in construction by trade. I've written a couple of pieces over the years that I've shared with my friends, or for my own private enjoyment. I even wrote a feature piece for Petersen's Bowhunting at their request, only to have them reject it ("we've run too many articles on that in the last two years"). I've always had this fear, a fear of actually taking the plunge, baring my soul and sharing my writing with others. What if people hate it? The barrier was very real. For whatever reason, Rebecca's post set off a gong in my head, one that still rings clearly and shrilly. I had waited long enough; it was time to get started, and thus Fontinalis Rising was born. What I didn't expect, was the effect that OBN would have. Sure, there's lots of contests, giveaways and other cool stuff. Much more than that, it is a means of connecting with other outdoor bloggers, to find people of like mind and interest. It has been a tremendous way for a non tech-savvy person like myself to find other very cool blogs, and I've found some of my favorites here. In the brief period I've been doing this, OBN has offered some great opportunities, such as the Trout Unlimited writing contest that brought four bloggers to Montana, or the opportunity to blog for Take Me Fishing. OBN provides a forum for it's members to showcase their work, and the ability to discover that of others. The gear review opportunities are fantastic, both for members, and the companies that provide them. The photo and writing prompts offer ideas and a chance for members to compare notes and ideas. OBN regularly offers members sound and savvy technical and blogging advice. They regularly alert us to important issues that could use our collective help, such as the danger that the Pebble Mine poses to the Bristol Bay salmon fishery. It has become an outdoor media clearing-house, and I predict will increasingly be seen by the outdoor industry and media as a force to be reckoned with. Hear OBN roar. So, to the founders of the Outdoor Blogger Network, Joe Wolf, and Rebecca Garlock, I want to say thank you. With a simple idea, you've created a monster, you command an army. Congratulations on a wildly successful first year. I quail to think of how you'll wield this awesome power over the next year. I can hear you out there- arms crossed and foot tapping. What's that you say? I haven't been a very good host lately? Haven't been sharing my coffee? I know, like so many others, I started out so reliable, you knew what to expect, and Monday Morning Coffee was served hot and on time. Then I started showing up late. Next thing you knew, you were just guessing as to whether there would be any coffee at all. Well, here's the scoop. You've heard me griping all summer about how busy I was, and I still am. I also ended up having to move the end of September, and it took a couple of weeks to get the internet back up- most of the posts you've seen lately, including my Plano Guide Series Waterproof Cases gear review (helpful hint- it's positive) were done from my local diner. There was a bit of misunderstanding between myself and the phone company- apparently I have to wire my house to their box, which I finally did. I wish I had photo editing skills of Mike at Troutrageous!, there has to be a photo of a beaver chewing on wires somewhere. So, despite the fact that I still am living in the midst of a pile of boxes, I did manage to crawl around, strip and connect telephone wire the diameter of hair, and now I'm working at getting this site back up to par. I have some cool and interesting posts coming up, and some projects in mind. I know I skipped September, but I will definitely get back to work on my Angler's Year series and write one about October. I have a guest post coming soon (that seems to be going around a lot, you may want to get immunized). The Outdoor Blogger Network, of which I'm a proud member is celebrating it's first anniversary with a week-long extravaganza, and I'm working on an appreciation post. Sometime soon I have a very special give-away contest courtesy of a very cool gear company. And I'm going to continue on working at writing quality posts for you to enjoy. Grovel, Grovel..... I'm in this months T.F.M. spotting contest over at The Fiberglass Manifesto, and the jerks fine gentlemen jerks people over at Third Coast Fly have decided to make it interesting by promoting their own Kevin Morlock. It's a tight contest so far, and I want to thank all my friends who have voted so far. If you haven't voted yet, please go to thefiberglassmanifesto.com and vote for me, Jason Tucker (yes, my first name is not Fontinalis). Here's the picture you're looking for. Ok, it's time for work. Or maybe fishing, who know's- let's get after it. thrown like javelins, just as sharp. if it came from a distant ocean or gulf. Did it get to know the birds? past the rocks and roots and bones and buried secrets. and creatures I know nothing of. when I touch the water? This gear review opportunity was offered way back in late May or early June by the good folks at Plano through the Outdoor Blogger Network. My information got lost in the shuffle and it took six weeks for me to get them, then I had to use them for awhile, since then I've moved etc. etc. ok, enough excuses, but my apologies to Plano and OBN for any seeming delay for this review. I think the mark of good gear is if you continue to use it after the review is over. In this case I do. I received these two Plano Guide Series Waterproof Cases in the mail in July, and I immediately thought of some uses. I'm not just a fly angler, I'm also a kayaker. Like so many of you, I carry a lot of sensitive items with me to the field and on the water. I typically carry a somewhat expensive DSLR camera, my iPhone, extra lenses, reels and so on. And yes, carrying and protecting these things while out and about has been a problem. I bought a clear vinyl dry bag for the camera, but if I'm not careful in those exciting moments on the water it gets banged around. I have bigger dry bags for the kayak, but again, there's some things that could use an extra measure of protection. First, the smaller box. I have one use for this box- my iPhone. It fits perfectly, and the last thing I need to do is replace that little monster. There's a lot of things you could put in there- keys, other electronics. An iPhone shaped sandwich. For better or worse, that little phone always goes with me, especially when fishing alone, and I've always fretted about where to put it. I almost dropped it in the river once while fishing my camera out of the dry bag. I can say truthfully that this little box goes with me on every trip, and I don't worry about my phone anymore. The clear poly allows me to check and ignore missed calls or texts, or for an extra layer of avoiding the electronic tether, you can cover it with silicone pad included. I don't like always carrying a phone to the river, and really don't like taking calls or texts out there, but I fish alone an awful lot, and it seems prudent these days to take it. This little box ensures my phone will still work if it's needed. I also like the wrist strap provided with this box- it provides some extra security when handling on the water or allows you to attach it to your waders or vest if you like. The cam latches on both of these boxes lock securely and I've never had one open without me. Ok, the big box. This one really shines in the kayak or drift boat. I use it to store my reels, wallet, camera, lenses and fly boxes- all the stuff I don't want to stuff in a dry bag or back pack, or have sloshing around the bottom of the 'yak. I've used this box kayaking local trout streams, and used it on my trip to Nipigon Ontario. The clear poly allows you to see what you have stored, or you can use the included silicone sheet to cover it all and make it less visible to prying eyes. This box has three locking cams, and I've floated this box down rapids with the above mentioned gear in it and it does what it advertises- keeps your sensitive items safe and dry. This box is in use full time, as I've found it to be extremely useful for storing ALL of my fly reels even when I'm not on the water. It holds six of them plus a few items. Now I always know where to find my reels, and it keeps them safe from me. (I can be a little tough on gear). I didn't find an MSRP on Plano's site, but found these boxes for sale on Cabela's. At about $20 for the smaller box, I think it's pretty cheap insurance for your phone, wallet, keys etc. The bigger box sells for $44.99, and with a camera, extra lens and a few reels in it, it's easily protecting over $1000 worth of gear. Cheap insurance for a one-time premium, and you won't have to make a claim. six reels, two headlamps, a GPS my lanyard, all protected from me! My thanks to Plano and the Outdoor Blogger Network for the opportunity to test some quality gear. No disclaimer, we all know the drill. My picture has been entered into this month's T.F.M. Spotting contest. The Fiberglass Manifesto has become a mainstay of the online fly-fishing community, and has gotten many of us, myself included, interested in glass rods again. He highlights a lot of smaller or obscure companies with quality products I would have never heard of that reach far beyond fiberglass. Cameron also has a very stylish, well put together line of swag, from stickers to hoodies, and if you're paying attention you'll notice I'm wearing his hats, shirts and sweatshirts on a regular basis on the river. This picture made it into this months T.F.M. Spotting contest. The post he did about it can be found here. If you can find it in your heart, head over to thefiberglassmanifesto.com and vote for me in the spotting contest. I don't win a whole lot. Really. Oh, and if you only know me as Fontinalis Rising, my name is Jason Tucker. Vote soon, vote often. My thanks to my friends who have already gone and voted.